The syllogism is logically sound. If the premises at true, the conclusion logically follows. It is also clear that the argument has appeal; recently a vocal atheist blogger named Leah Libresco2 converted to Catholicism, basing the reason for her conversion on the argument from morality. As with any syllogism, the conclusion only follows if the premises hold. In this article I propose that neither of the premises do and focus the meat of the article on the second premise. Some atheists like Matt Dillahunty from the Atheist Experience TV show in Austin, Texas3 accept premise 2 (the existence of an objective morality) but see no need to posit a god to explain it. I agree that in so far that objective moral or immoral acts would exist, it is hard to see how a god would be necessary to determine if and how those acts are moral or not. The Euthyphro dilemma4 comes to mind here. Either the morality is subjective (as it depends on God's opinion) or it is objective but then there is no god necessary for that determination5. And if, for the sake of argument we would grant that an objective morality exists and that a god is needed to lay the foundations for that objectivity, how exactly are these communicated to us? If we look at how the moral zeitgeist has shifted in the past 20 centuries, one can only conclude that either the Christian god has a sloppy way of communicating his foundations or morality is far from objective (for the sake of brevity I disregard the possibility of non-Christian gods, but in general the objection to those is analogous). Less than 2 centuries ago, slavery was still commonplace in Christian countries and Christians claim the credits for its abolishment (contrary to their own scriptures). Then women had to gain equal rights, then the same had to happen for non-caucasian races and we are at the brink of granting equal rights to homosexuals. If history is any indicator, in a couple of decades Christians will claim the credits for that grant as well. But even though all previous objections to premise 1 are valid in my opinion, those are not my primary objections to the argument from morality. I primarily take issue with premise 2. I don't believe in the existence of an objective morality. Unlike most apologists I've encountered, Dr. Craig makes a distinction between moral values and duties, the former indicating what is good or bad and the latter indicating on what is right or wrong. The distinction deals mainly with the presence or absence of an obligation to act or not to act. I disagree with Dr. Craig that values (good or bad acts) are within the scope of morality, the reason for which will become clear later. The second distinction that Dr. Craig makes is between objective and subjective. He defines objective as an independence of anyone's opinion. Even though this is enough for my case against the moral argument, I think he sells it short. To be objective it should also be independent of circumstances. If an act is moral in one situation but the same act is immoral in another situation, I have a hard time to understand it as objectively moral or immoral. Now let's study a few examples to see if the act is moral. Dr. Craig has a favorite example: torturing babies for fun is objectively morally wrong6. I don't think so and will get back to that example, but let's start easier. Example 1: is lying morally wrong? Of course, you'd say. The Christian bible made that such an important issue that it is even named as number 9 from the 10 commandments: "Thou shalt not bear false witness against thy neighbour" (Exodus 20:16). Imagine that my colleague lost his wallet containing a few hundred euros and I found it. If on request I would lie and tell him that I haven't seen his wallet so I can keep the money, it would pretty much constitute an immoral act. Now in another situation, imagine that I had an affair outside of my marriage and ceased having the affair. If my wife would ask me if I had an affair and I would lie by telling her I didn't, it's not so clear that the lie is an immoral act. Telling the truth would hurt her feelings and could cause a breakup of the marriage which could be detrimental to all parties involved, not only me. The drawback of lying in this case is that an earlier immoral act goes unpunished but that is irrelevant to the evaluation of the later lie. So would this lie be an immoral act? I'd say the jury is out there. (Please note that all examples are purely hypothetical, this one included!) Now let's go one step further. Let's assume that your neighbor stands at your door covered with cuts and bruises and she seeks refuge at your home because she is afraid that her husband will kill her. You grant the refuge. Now if some time later the husband rings your doorbell holding a baseball bat and asks if you've seen his wife, would it be immoral to lie to him? I think quite the contrary, it would be immoral not to lie to him. This example shows that the same act, namely purposefully lying to someone else, can be judged as immoral, moral or ambiguous depending on the circumstances. So is purposefully lying to someone else objectively immoral? I'd say no. Example 2: is purposefully causing someone else physical pain morally wrong? In general you'd say yes, but here too it depends on the situation. If I'm angry at someone and hit her in the face (unprovoked), it should be considered an immoral act. If you spank your child you are also causing physical pain. Many Christians would say (based on the bible book Proverbs) that this is the moral thing to do for it is part of properly raising your child. I'm not so sure and I am not alone in this hesitation. As a parent I think I've not done all too bad in raising my children and I can remember only once that I spanked one of them. In retrospect I don't think even that was necessary and in general I think it's not. If I take into account that spanking has gone horribly wrong in a few infamous cases and the fact that it does not seem to be a necessary part of good parenting, I'd say that the morality of spanking a child is at least ambiguous. What about physical pain caused by a tattoo artist? Here the pain is inflicted by request and the act is generally not considered immoral. Some people, like those who interpret the KJV translation of Leviticus 19:28 literally, might consider it immoral but that consideration is based on the aversion towards tattoos, not on the affliction of pain (here too the moral zeitgeist has shifted). What about a surgeon who inflicts wounds on someone's abdomen for being able to remove a tumor? Here we'd say that it is the moral act to inflict the wound. This theme, doing something bad for a greater good, is a general theme in (Dutch) jurisprudence and is named "absence of material illegality" (translated literally). In Dutch jurisprudence this is established in the 1933 case in front of the Dutch supreme court where a veterinarian purposefully exposed healthy cows to the disease during an epidemic of foot-and-mouth disease, an act which is forbidden by law. But by doing so, he exposed the cows to a light form of the disease to boost their immune system so they could resist the heavy form if and when it would arise. For aforementioned reason the court acquitted the veterinarian7. Again we see that in the case of inflicting pain the morality depends on the circumstances. Example 3: the expensive Chinese vase. The two previous examples show acts that can be judged as moral or immoral depending on the circumstances. That was not included in Dr. Craigs distinction between objective and subjective. Now let's use look at two examples would qualify his distinction. If I have a verbal fight with someone and my anger raises to a point where I take an expensive Chinese vase belonging to the other person and throw it on the ground where it breaks, I clearly commit an immoral act. Now what if a baby who has barely learned to walk picks the vase and throws it on the ground to see if it bounces, and it breaks? I can hardly think of anyone who would consider it immoral. Why? Because the baby lacks the capacity to make a moral judgment about the act. That would not make the act any less bad, a very expensive vase has just been destroyed, but here is a clear example that bad does not constitute immoral. For this reason I think that Dr. Craig's distinction between moral values and moral duties is superfluous. The primary parameter to determine if an act is moral or not is the actor's ability to make the moral judgment on the act. So yes, personal opinion does matter and here is a clear example which is not objectively moral by Dr. Craig's own definition of objectivity. Now just like in the previous example, even this extreme example is immoral if and only if the torturer is capable of making the moral judgment. What if the torturer has an extreme form of narcissistic personality disorder and actually thinks that torturing babies is funny while seeing no harm in the act of torturing? Such a person is an extreme danger to society and we would lock him up in a mental institution to prevent such acts of happening, but we would not conclude that the act was immoral for the same reason that we do not consider the baby's act in the previous example to be immoral: the actor lacks the capacity to make a moral judgment. It is not without reason that judges do not penalize small children or mentally handicapped people for acts that get mentally healthy adults convicted. We as a society will take measures to prevent repetition of the act which might include forcibly hospitalizing the person, but we do not judge the act as immoral, not even an extreme act as this example. Even torturing babies for fun is not objectively immoral. We've seen a couple of examples showing that either the circumstances or the actor's opinion is influencing the moral evaluation of an act by the society at large. Limiting the scope of such acts to only those situations that the rule generally applies to or only to people who have the capacity to make a moral judgment would move the goalpost, which is a fallacy. Such a limitation has nothing left in common with objectivity. On the other hand, even though I think I have shown that these examples are not objective in their morality, I have not disproved premise 2. Doing that is impossible, since that would constitute proving a negative. All I can do is to evaluate examples from the other camp, like Dr. Craig's "torturing babies" example. The positive statement is being made by the apologist so the onus is on him or her to provide an example that is objectively moral or immoral. I take the null hypothesis and lack believe in the existence of an objective morality until such is proven. This is such a misrepresentation of secular morality that I wonder if his misrepresentation is accidental or intentional. Yes, on a per person level one could actually say that anything goes, but we are not living on deserted islands. We are part of communities and within those communities, a consensus on morality is reached. In general this consensus seems to thrive on minimizing harm and promoting happiness in the community. Dr. Craig's examples of crimes in Nazi Germany, the killing fields in Cambodia and the like are straw men arguments. One could say that according to the morality of the perpetrators the actions were moral (even though I doubt even that: in power structures people can be made to do things that are contrary to their own morality, see e.g. the Stanley Milgram experiment9), but more important than that, the moral judgment of the victims is left out of the equation. Secondly, if the argument: "without a divinely ordained objective morality, anything goes" would hold any water, then there should be at least be a minor positive correlation between communities where the religious adherence is low and a morally detriment society. It seems that the contrary is observed. A cursory survey of the religiosity of the prison population in the U.S. shows that atheists are underrepresented in comparison to the demography of the total population10. Another example is that in comparing various European countries and the Unites States, the countries with lower religious adherence tend to have happier and more empathetic societies11. 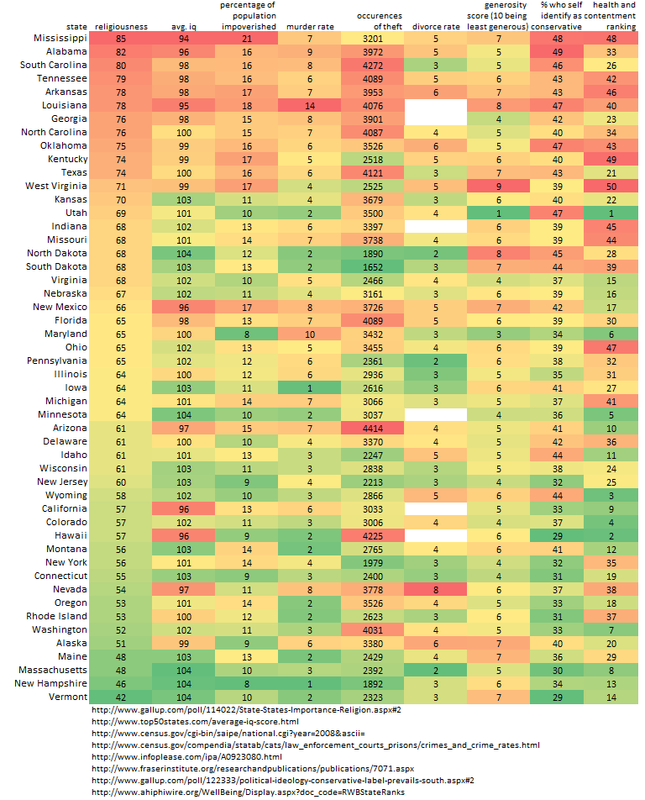 Even comparing various states in the United States12 in similar ways show the same trend. So if not divinely ordained, where exactly does morality come from? The answer is not evident, but I strongly adhere to the theory that morality is a product of natural selection. We see primitive forms of morality in other animals species, e.g. the reciprocal altruism we find in the blood sharing between blood sucking vampires13 but also empathetic behavior among chimps14. Dr. Craig often quotes philosopher Michael Ruse15 who also holds the position that morality is an evolved trait and quotes it (slightly mockingly) as if it should be self-evident that the position is wrong, but he offers no rebuttal to it. He just goes back to his premises and assumes they are proven. They are not. Also, from an evolutionary perspective, kinship is important. That's why we are more likely to lend a helping hand to closely related individuals than we are to do that for others that are not that closely related, especially when the help we provide has an impact on our own lives. I could imagine donating both my kidneys to one of my children, but I don't think I would donate a single kidney to a stranger unless I would be terminally ill (or dead). This makes perfect sense from Richard Dawkins' "selfish gene" evolutionary perspective. From a personal perspective, I would say that my morality is mostly based on selfish reasons: I would not want to live in a society where it is commonplace to treat others immorally our unjustly because I wouldn't want to be a victim of such treatment myself. That's why I will contribute my part in preventing such a society of getting a foothold. The general rule that I use to determine when to contribute or not, is the Platinum rule (a variant on the Golden rule): treat others the way they themselves wish to be treated. This is not an absolute rule though. It is more of a guiding principle and is limited by some factors like reciprocity and personal cost. As an example of the first: I will not help a convicted criminal to escape his sentence since he/she did not treat society likewise. As an example of the second, I will not help my neighbor in doing something that will endanger myself or others. I am aware of the objection to the Euthyphro dilemma, i.e. that there is a third option: morality is part of God's nature. Dr. Craig has a paragraph in the article mentioned in note 1 where he makes this exact point. Dr. Garret Merriam, a philosopher at USI, dealt with this on his YouTube channel. The third option triggers a next-level dilemma, i.e. "is God in control of his nature or is God not in control of his nature". In the first case we are back at subjective morality. In the second case, something other than and outside of God is the true source of morality and we are at risk of getting into an infinite regress. This case is known as "Huizense veearts" at is available in the journal Nederlandse Jurisprudentie NJ 1933.918. This is the result of an 1997 inquiry by Rod Swift from the Federal Bureau of Prisons, online available at http://holysmoke.org/icr-pri.htm (retrieved on August 8th, 2012). It would be worthwhile if a formal study on this subject would be conducted. Visually represented in the following table: http://i.imgur.com/kpb5A.png. The studies used for this image are given in the image, some of these are no longer online. Rob, You're a Linux Freak. God love you for that, mate. So now you can't be that kind of atheist you claim because Linux is a religion LOL. Well the one thing is this, you and me have a something in common.